Periodically I'll be moving older items of news here from the main page, so that the content there stays reasonably up to date. Any links included will still work, subject to the content to which they direct you still being available. Following this link will take you to a new section on London Underground's own web site which has a pretty comprehensive guide to all our current Rolling Stocks, including non passenger types. Also included is a bit of rolling stock history. It has some pretty detailed information such as details of motoring and braking systems, stock formation, dimensions and so on - though the eagle eyed amongst you will notice a few errors! But these are probably only apparent to either the real enthusiast or experts on the individuals stocks. The guide comes in the form of a 6Mb Adobe document, so you'll need this program to read it and it'll take a while to download too I'm afraid, but it's well worth viewing. I understand that London Underground will again be advertising externally for Train Operators in the near future. Adverts will appear initially internally in the Traffic Circular for a period of four weeks in the immediate future, and the advert will then 'go public'. I presume that thetube.com recruitment section will be a good starting point for those interested. Just as things seemed to have quietened down following the Chancery Lane derailment and the resultant suspension of the Central Line, a further report carried by the BBC suggests continuing problems with the 92TS fleet. The full BBC report can be read here http://news.bbc.co.uk/1/hi/england/london/3198807.stm. Whilst I am inclined to believe that there is a degree of Journalistic sensationalism to this piece, the response from London Underground does confirm that there is an ongoing programme of inspection in place and that there was certainly no denial of the truth of the story. A colleague on the Central Line informs me that this problem was identified during July, but had not been made public until the BBC 'spilled the beans'. I presume that this is because the problem is not considered by the appropriate Managers to be sufficiently serious to either need speed restrictions to be placed on the stock or for the fleet to receive my urgent attention. A check on thetube.com as I write this reveals that there has been no press release on the matter. I believe that (unsurprisingly) the response to the internal advert is very high and the probability of recruitment going 'external' is very low, and will not occur for 'at least six months'. Many of you will know that there is a preserved 1938 Tube Stock Unit that is owned by the London Transport Museum and which is now fit for running. It will be operating a special service (not open to the public) on Tuesday 23rd September 2003, departing from Acton Town at about 1230hrs. I believe it will run to Oakwood and then return to Acton Town. A rare opportunity to see a bit of London Underground history in action! For a change this relates to stations - let it not be said that I don't try to take a balanced view of the organisation! I understand that Victoria Station is to undergo a major programme of works which will commence in 2007. I t will include the provision of a whole new level, 21 new escalators, 20 new entrances and a whole new station building. Work is expected to be completed in 2014. A real personal hate of mine is the amount of graffiti that appears all over the system. All too infrequently (or at least it seems so to me!) the BTP (British Transport Police) are successful in catching and prosecuting the culprits, and the outcome of a recent case can be read here. However, this statement does leave me a little confused! Whilst I realise that the culprit has had an Anti-Social Behaviour Order placed upon him and that he is banned from various places and activities for a period of five years, I wonder why the specific charges relating to the act of vandalism dropped! London Underground has spent millions of pounds on attempting to secure depots and sidings - and I am sure this has had an effect - but graffiti continues to be a problem. I'm sure that the BTP have a good idea of who many of the culprits are and I wonder why prosecutions are not more frequent! Furthermore, the court sentences don't seem to have the desired effect of deterring others. Perhaps if they included the involvement of those convicted in cleaning up the mess they've created, this would have more of an impact! However, I'm sure the answers are in these days of 'Health and Safety' and 'Political Correctness' it would be seen as too dangerous and arduous! Vandalism to trains whilst in service also continues, although it does seem less frequent than has been the case in the past. But trains still continue to have to be withdrawn from service on a far too regular basis through broken windows, fire extinguishers having been discharged and safety equipment stolen! Recent campaigns have had some success, though these do seem a little 'piecemeal' at times, rather than ongoing attempts to really stamp out the problem. Of course it is the travelling public who are inconvenienced when this occurs, and that does nothing to help our public image, I'm sure! There are well known 'hot spots' for these problems - let's hope that some really positive action will be taken though - cynically perhaps - I'm afraid I'm not holding my breath! The Interim Report into the derailment of a Piccadilly Line train between Hammersmith and Barons Court on the 17th October 2003 has now been released and can be read here. This incident was, of course, very much overshadowed by the derailment of a Northern Line train at Camden Town less than forty-eight hours later which resulted in personal injuries and major disruption to services for many days. However, the report highlights a number of areas identified for further investigation, mostly revolving around working practices and the adequacy of inspection of track condition. Coming from the 'operational' side of London Underground, I was interested to read the description of events and the review of the response as summarised in section 4.2 of the report. Certainly my views as I read the report raised a few question marks in my mind, and these were highlighted in this paragraph. It will be interesting to read the final report - which is due on the 28th November 2003 - to see if there are any further recommendations which arise. I was interested to read on thetube.com this article concerning a substantial increase in resources for the BTP. The full Press Release can be read here. One point I noticed by its absence is that, whilst much is made of 'passengers' and 'communities', there appears to be no comment about 'supporting staff'. It may well be that this is intended to be implied, but I know from the comments of many colleagues that they feel that they have not always received the support they need from BTP. I hope this is an omission on the part of the writer of the release, and not on the part of the new 'initiative'! But, in a spirit of optimism, I hope this is intended to address more consistently the rather 'piecemeal' approach I referred to above. On a topic which has relevance to both my comments on the policing and graffiti issues, I see that a Press Release has also been issued by London Underground concerning the use by a well-known London Estate Agency of a graffiti style 'tag' on their vehicles. This can be read here. Irrespective of the comments, it is interesting to note the cost of graffiti to London Underground and the number of incidents recorded and the number of tags removed. A couple of items in the news caught my attention in the last twenty-four hours. The first concerns the reinstatement of a Metropolitan Line driver who was sacked following his failure to take a breath test - the full report can be read on the BBC's web site. In my view the man is extremely lucky to have been re-employed, albeit in a clerical capacity of some sort which will mean that his income will be severely affected. If he wishes to become a driver again he'll then have to go through the same procedure as anyone else, and although I'm sure the recruitment process does strive to be impartial, your past employment record is taken into account, so he will have to behave completely 'by the book' in the intervening period. Inasmuch as some of his colleagues passed this story on to the BBC it seems that they are less than impressed by his reinstatement too! London Underground's policy on the question of the use of drugs and alcohol, fitness to work and the acceptance that you can be tested at any time (and this does happen) is clear, and someone who is a Union representative should understand these rules better than anyone. On a more positive note, I was pleased to find a release on thetube.com concerning the jailing of two muggers for attacks they carried out on the Metropolitan Line. The sentences they received seem to be a great improvement on some passed in the past - let us hope this is a trend that continues, and that such treatment in conjunction with the initiative I detailed above will act as a real deterrent in the future. In my opinion the judge's comments were absolutely spot on and his lifting of reporting restrictions quite correct - this helps to get the word out that this kind of behaviour is not acceptable. As has been well publicised there were two derailment incidents on London Underground involving passenger carrying trains on the 17th and 19th October 2003. An 'add on' page has been created covering these, as the text is quite bulky and deserves space to itself. It is pleasing to see that the BTP's war against vandalism and graffiti continues with another custodial sentence being imposed by one of these so-called 'artists'. Read the outcome here. In summary, the individual got a three month custodial sentence and a ten year Anti-Social Behaviour Order was imposed. On a graffiti related matter, and one that I found most revealing on the mentality of these 'persons', I took a train out this week, and during the course of my duty it started to rain. I noticed that there appeared to be coloured ink running down the windscreen. On further examination I found that the cab had been 'tagged' above the windscreen, but that the sad individual concerned must have used a water based marker in the application of his tag! Oh dear - I've always wondered at the mentality, but that leaves me falling about! Perhaps the tagger was concerned for the environment, and thought it better to use a water based marker rather than a permanent one, which requires a much harsher solvent than water! A quick check of the tube.com web site reveals a number of further convictions and initiatives on the matter of graffiti - visit their news archive here to read more details of these. There are also details of yet another initiative for the reporting of such activities; I hope this is adds more weight to the current campaign against graffiti, and also hope that it isn't short lived! However, it is well known that our new Managing director, Tim O'Toole, has a hatred of this activity, and certainly this area has certainly gained momentum since his arrival! It was also good to see that a ticket tout has also been successfully prosecuted for his activities. This update falls into two parts - some bad and some good news! As seems to be almost a 'tradition' the graffiti merchants were out again on Christmas Day, taking advantage of the closure of the network. Earls Court and High Street Kensington stations were particularly badly hit, although several other stations and other parts of the infrastructure were also vandalised. However, the clean up teams were quite quickly in operation and much of the mess has now been cleaned up. I feel quite sorry for these individuals that they've nothing better to do on Christmas Day! Yet another vandal has been sentenced severely for his efforts in defacing London Underground property - read the report on London Underground's web site here. I hope other judges will take note of the severity of the punishment and follow the example of District Judge Davidson! It had originally been my intention to include some of what follows within the 'Driver's Diary' page that has also been added today with the same title as this and which can be read here. But I feel that what follows should be more appropriately included within this section. As is I'm sure well known, London had a bit of inclement weather during this week - not unreasonably considering the time of year. Sadly London Underground - along with many other organisations and providers - didn't perform too well, some lines faired worse than others which has led to an apology appearing on thetube.com and which can be linked to here. I think it's worth putting a bit of flesh on the bones of that statement though, and I can give as an example the experiences related to me by one of my colleagues on the District Line. Following the snowfall yesterday evening, he was having his meal relief at Barking. While there a C stock train stalled in the sidings due to ice on the rails. The DMT arranged for my colleague's second train to be cancelled, so that he could be kept around, as all the other District Line Train Operators were from Barking and Upminster, and are not qualified to drive C stock. This would mean that he could be used to assist any C stocks that became stalled. Sure enough, another one soon became stalled, and my contact, the DMT and a Hammersmith & City Line Train Operator went down to the sidings. The train was completely stalled, with all shoes (the devices which pick up the current from the current rails) being off current due to ice on the current rails. 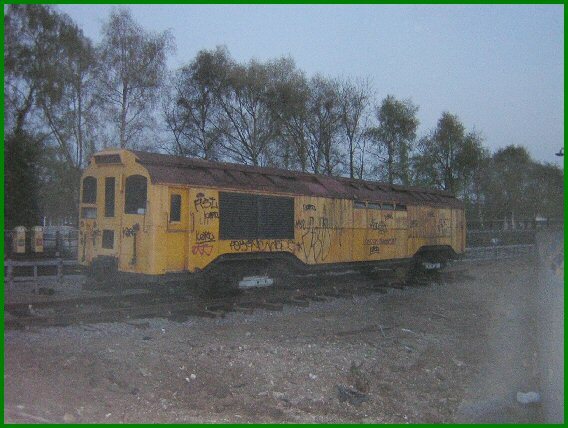 It was decided to try scraping the rails, when they came upon the first problem of the night - the ice scrapers (devices carried on trains for the purpose � they are insulated metal devices which are intended to be used by fitting over the current rails) don't fit on the positive rail because of the kick boards! (These are strips of wooden planking to protect from the possibility of tripping onto current rails) This immediately made it difficult to scrape the rails effectively. The next problem was actually scraping under the shoes - although they could use a paddle (a wooden device, about three feet long with a chamfer at one end) to lift the positive shoes, it was very difficult to get to the negative shoes. Even when they had lifted the shoes, there was no effective way of scraping the ice from the rails, as the ice scraper is not suitable for working at the side of a current rail, only for scraping from above it. This also made it difficult, if not impossible, to scrape from the location of the positive shoe to the front of the train, a distance of approx. 6 feet. It is impossible to scrape the negative rail under the train at all. This means that, even if you can clear the ice from the rails ahead of the train, and maybe under the shoe, the moment the train moves off, it is immediately stalled on icy rails again! Another problem is with the de-icing units on the trains. They are designed to only spray fluid while the train is motoring. This is to prevent wasting the fluid by spraying while the train is not moving. However, this also causes more problems, in that, if the motor car is on icy rails, the motor won't be working, so the de-icing fluid is not sprayed! My colleague has also have been told, that only ONE unit of C stock has de-icing equipment that actually works. He doesn't know how true that is, but certainly on this occasion there were three units of C stock in Barking sidings that had de-icing equipment on them, and none of them were actually spraying any fluid, despite being switched on. Of course this COULD just be that they had run out of fluid during the day. But this story does have one slightly optimistic and encouraging footnote! He felt so strongly that the situation was a matter that should be raised to the highest level, he emailed an account of the event to our Managing Director, Tim O'Toole! Not only did he receive a very frank and honest response, but he received the reply within three hours of sending his communication. This experience certainly suggests that Tim really does want to know what's going on 'at street level' and appreciates us Operational types communicating directly with him - there have been other examples too where he's responded positively to concerns raised directly with him, and he's not too grand to actually come out and see for himself. Long may this last! That, of course, is just one story that I'm sure has echoes around the system - certainly most of the tales I've heard have involved depots and sidings, rather than problems encountered on the running lines themselves. I believe the situation was a little exacerbated though because shortly before the snow started to fall, it had been raining. This would have meant that any de-icing fluid that had already been laid would have been washed away, exposing the current rails to the full affect of freezing conditions and the subsequent snow fall. It will be interesting to see in the future what steps are taken to minimise service disruptions. I don't think that it will ever be possible to prevent some delays, but I'm sure that ways can be found to keep these down if all the parties involved are committed to doing so. A couple of matters have caught my eye over the last couple of days. The first is the announcement of extensive weekend closures of the District and Circle Lines between Earls Court and Whitechapel - a link to read more on this is available here; as I write this there has as yet been no official announcement on London Underground's web site that I've been able to find, so this is the Evening Standards version of the plan. With the proposals for all the upgrades under PPP this sort of event is inevitable - the job is just far too big to try to contemplate during the normal nightly Engineering Hours. In some ways I'm surprised that the decision (if indeed it has been taken) isn't to shut down the area entirely and really 'blitz' the work. Of course this would mean a closure of several weeks (in the same way that has occurred in the past on occasions) and would mean that commuters would have to find alternative routes - perhaps it's felt that the strain on the alternative transport options would just be too great. The second matter was the incident yesterday between Farringdon and Barbican Stations of cable brackets striking trains. More on the can be read on the BBC's web site here and the Evening Standard's version here. I notice that the two sites offer slightly differing versions of the event which caused the damage. As yet I've not seen an official version of the event and, again, LU's web site is silent on the subject. Certainly whilst I was working yesterday the outer rail Circle Line service was suspended and the announcements being given were that this was because of emergency engineering works at Farringdon; I think I only saw one outer rail Circle Line train and this was at about 11.15 a.m. whilst I was at Tower Hill, though whether this train had come round from Aldgate or had come from Aldgate East I don't know. A review of the Network Control Centre's Manager's Daily Review for the day essentially confirms the details as published. Although this expands a little on the detail it adds little more to the story; most of the additional details are really of an internal and operational nature - who did what and when. I see that the dates for this year have now been published on the Museum's web site and the full details of this year's dates can be viewed here. The first of the year is on the weekend of the 6/7 March 2004 and the theme is 'London's transport in miniature' - this certainly looks as if it'll be worth the admission fee and work commitments permitting I'll certainly be paying it a visit at some point over the weekend! As I am sure you will be aware, there is always a series of ongoing programmes to address the reliability, serviceability, safety and appearance of London Underground's Rolling Stock. Details of the latest plans for the C Stock have recently arrived with me - many of the items included will be invisible and are aimed at improving the reliability of the fleet, some are aimed at improving the drivers environment but some are to improve the appearance of the trains, and these will be visible to passengers. These I detail here. Larger route maps. The area around the door vestibule is prone to graffiti. New larger route maps are to be fitted reducing these areas. Cab end bulkhead panels. These are prone to graffiti. New panels are to be bonded on to the cab end bulkheads which should enable cleaning to be more effective. Bulkhead advert panel. The area above the bulkhead window is prone to graffiti. New advert panels are to be fitted reducing the prone areas. Saloon sliding door interior panel. The interior of the sliding doors are prone to graffiti. New panels are to be bonded on to the doors which should enable door cleaning to be more effective. New roundels. Replace all damaged roundels with improved scratch resistant type. Tail lights. These are prone to failure and require regular replacement. New LED type indicators to be fitted increasing operational life. I understand that the implementation plan will commence from 30 April 2004 and the fleet will be completed by 30 June 2005. 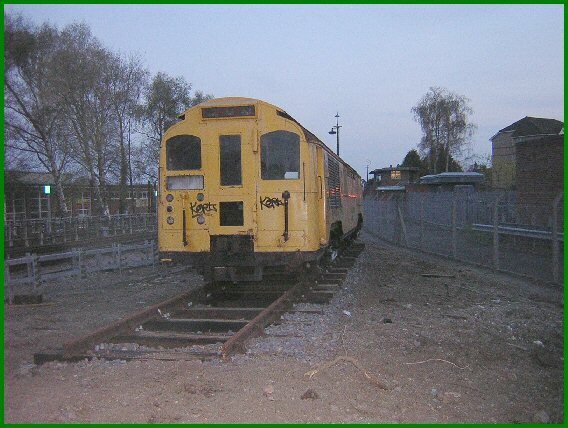 One train will be modified each week and the work will be undertaken at Hammersmith Depot. I see from London Underground's web site that the full Northern Line service should resume 'within two weeks' - the full press release can be read here. You will no doubt recall that following the derailment at Camden Town the service has been split into two branches pending the completion of modifications to the pointwork in the area. This will see the full reintroduction of the 'integrated service'. For the full circumstances and links to the reports visit Camden Town Incident page on this site. It has now been confirmed that the full service on the Northern Line will resume on Sunday 7 March 2004. A further Press Release with full details of both the reintroduction of the service and of the testing that has been carried can be read here. It's long been a source of hilarity on Britain's railways that the 'wrong type of leaves' on the line are causing delays. Well, the District Line went one further last Sunday (22nd February 2004) when at about 1300hrs a very large tree fell onto the District's eastbound line just west of Barons Court station. I wasn't working myself, so I'm unable to add any personal experiences to the event, but the following are the 'broad bones' of the occurrence and its aftermath. In addition to completely blocking the eastbound District line track, it also partially blocked the eastbound Piccadilly line. The District was suspended from Earl's Court to Richmond and Ealing Broadway in both directions. Eastbound Piccadilly line trains were able to pass at caution speed with the branches of the fallen tree scraping the sides of passing trains. Initially it was estimated that services would resume at about 1600hrs. The Emergency Response Unit (ERU) were sent to the site, arriving at about 1400hrs, although apparently they did not have the necessary chainsaws initially. Traction current was discharged on the eastbound District line from Ravenscourt Park - Barons Court and Barons Court - Earl's Court (there are two sub sections involved on this part of the line, hence the two sections needed to be discharged). By about 1430hrs the branches of the tree had been removed, with the trunk remaining in position, awaiting the arrival of the chainsaw gang. They arrived and commenced work at 1440hrs, but by about 1500hrs they had to admit defeat - the tree trunk was resting against a wall with the branches on the track, and this made removal a hazardous task. The London Fire Brigade were contacted and a crew sent to site. They too could not do anything themselves, and suggested contacting local authority tree surgeons, which they did. The Metronet Duty Operations Manager (Engineering) (DOME) was also on his way to site by road, and arranged to meet Civil Engineers on site, who could arrange scaffolding. There also appeared to be some cable damage where the tree was resting, although all signalling was functioning correctly. The possibility of bringing in an engineers train with a crane to lift the tree out was investigated, but all available cranes were in use in the King's Cross engineering works that were underway. By about 1530hrs it was clear that the initial estimate for the resumption of services would not be achieved, and this was revised to 1800hrs. Four buses were being arranged to enable a shuttle service between Turnham Green and Richmond to commence by 1600hrs. At 1615hrs a second ERU crew attended who were better qualified in tree surgery, and the Piccadilly Line eastbound service was suspended to allow them another attempt. Piccadilly Line services resumed at 1650hrs, but the tree was still obstructing the District Line, although progress was being made into reducing the size of the obstruction. By 1730hrs the majority of the trunk had been reduced to manageable pieces, and plans were made to move all the debris onto the eastbound platform for removal through the station on to lorries. This overcame the need for an engineers train to be brought in to assist in removal, which would have necessitated interrupting the Piccadilly Line again. At about 1820hrs, after running a test train to check the track, through services resumed on the District Line, with trains non-stopping the station eastbound while the clear-up continued. I think it was extremely fortunate that no train was passing the point of the incident when the tree fell; the consequences could have been terrible, either if the tree had fallen right in front of an approaching train or if had fallen onto one. I know that there were trains stuck between Richmond and Ealing Broadway for many hours. I believe that it was necessary to ferry relief drivers to these stalled trains. Though unable to stop at Chiswick Park in both directions and Stamford Brook eastbound, the Piccadilly Line would at least have been able to assist the majority of passengers between the affected stations. I also understand that the owner of the property from where the tree appeared could be facing a bill running into in excess of �1m for the costs involved; I hope his insurance was up to date! I am sure that any of you who use the District Line will have noticed the graffiti tag 'TOX' suffixed by numbers to represent the year of his 'activity'. This individual has probably been about the most prolific 'tagger' over the last few years, but it appeared that he had gone quiet since the beginning of this year; personally I was hoping that he'd either grown out of it or had been caught and was keeping his head down prior to a court appearance. Sadly this does not seem to be the case; I noticed today (so I presume he was busy overnight) a number of trains that had been freshly tagged either 'TOX04' or 'TOXIC04'. Although a few of my colleagues suggested that perhaps it was a copy cat tagger I don't think this is likely to be the case; from my limited knowledge of the culture the individuals concerned only ever apply their own tag and would never apply another's! From discussions I've had I understand that 'TOXIC' is one of British Transport Police's highest targets, and I presume that he's been keeping his head down and has now come out of retirement to thumb his nose at 'authority'. London Underground announced some time ago an initiative to encourage people in the community at large to play their part in combating this vandalism. Read the Press Release here. Our Managing Director, Tim O'Toole, has made his hatred of graffiti abundantly clear, and clear plans and targets are being put in place as far as the trains are concerned - there are significant moves being put in place for an extensive clean up and improved materials are being phased in to maintain the resulting improvement. Tim has requested staff to play their part in the campaign; I hope others will respond as willingly as I intend to do! Perhaps if the offenders realise how short lived their efforts will be they'll go away! But I fear many will continue to see us as a target! Since writing the above I ran into a colleague at work last week who tells me that TOX was caught 'red handed' on London Underground property in the last few days, was apprehended and is now in custody under the terms of the Anti-Social Behaviour Order. I'm pleased to be able to say that a correspondent has indeed confirmed this arrest, and a little trawling at work has confirmed that he was indeed caught 'red handed' in Brixton sidings and arrested. Apparently materials of his 'trade' were also retrieved. I look forward to hearing what the final punishment for his crimes are; I hope that recent convictions will be used as a precedent for his sentencing. London Underground's web site reports that one of the worst serial scourges has indeed been caught and sentenced - read the report here. Whilst this is undoubtedly good news, I have to say that I personally feel that the treatment he has received is far too lenient. In comparison with some of the other sentences passed down in the last few months Halpin seems to have got off very lightly; I think perhaps it is a shame that Judge Snow did not feel it necessary to pass him on to a higher court for sentencing as has occurred in other cases. However, two things occur to me over this; firstly I suppose the judge has to sentence on the basis of the evidence before him of the specific charge before the court and I also see that there is no mention of the offences allegedly carried out in Brixton sidings when I understand he was apprehended. I wonder if that will mean that we can expect to see him in court again when a further case is prepared? Personally I hope so! I am certain that wherever you are around the world the dreadful events that occurred on the morning of Thursday 11th March 2004 on trains in Madrid will have dominated the news and media and I am sure I do not need to go into details of the event itself. The purpose of this site is not to express any political views, but I cannot help but comment that, no matter how strongly such views are held, surely there can be no justification for such carnage. "On a more sombre note, I suppose that you have seen the reports from that terrible terrorist attack in Madrid. Horrible things - no matter what your convictions are, how on earth an you justify the murder of civilians? As it turned out, one of the deceased victims were a member of SFF-CGT, the Spanish railway worker's union my union am collaborating with, so I had to start this morning by writing a letter of condolence on our behalf to them. Sad, really. I am very, very glad that such things are almost unknown here in Sweden"
On behalf of all who visit here I'm asking 'The Hedgehog' to add my condolences when he has an opportunity to do so. I have not been at work since this attack occurred, and I don't know what the general impact has been amongst my colleagues and I am sure that London Underground will have issued instructions concerning extra vigilance, which it would not be appropriate for me to detail here in any event. But in an 'open society' such as we live in how can any form of public transportation be made immune from such atrocities? I don't think it ever can. All we can do (whether as staff or passengers) is to vigilant and report anything suspicious at the first opportunity and to act appropriately. The railway systems of the world can never be subjected to the kind of security vetting as the airlines were able to impose after the 11th September 2001, so are inherently a 'softer' target. So we must all play our part to reduce the risk to 'As low as reasonably possible'. Of course London Underground has been a target in the past. On the 15th March 1976 (almost twenty-eight years to the day as I write this) a London Underground driver was shot dead after terrorists detonated a bomb on his train. See the BBC's archive of the event here. The scale was smaller, but that is not to say that in future it could be different. As I detailed in the update added to this page on 12th February 2004, London Underground has now confirmed that over a number of weekends there will be closures of the lines between Whitechapel and Earls Court. Full details are available on London Underground's web site here. On an associated matter, London Underground has announced that there are no plans to extend weekend engineering works into 'non weekend' days; a Press Release has been issued to this effect, and can be read here. In a nutshell, what is being said is that the PPP Contracts state that the necessary renewal works will be done either in 'Engineering Hours' or by the use of weekend closures. However, this Press Release doesn't seem to close the door on or rule out longer shutdowns; I think the keyword in this is 'planned'! The problem with weekend 'Engineering Possessions' is that they're fine if the works are all completed (and completed to the required standard) on time. If they're not, delays on Monday mornings are the inevitable result, and these, understandably cause untold problems. I believe that such an occurrence happened with the Piccadilly Line's current track upgrade between Acton Town and Heathrow for example, with the result that not only was the Piccadilly Line unable to recommence services, but that the District Line was affected too, so that was a double whammy for the travelling public on the Monday morning. A Piece of London Underground History Saved! Mention is made elsewhere on this site of Cravens Heritage Trains, and I'm pleased to say that the group has succeeded in securing another piece of London Underground history for the future in the form of the former Acton Works shunting locomotive L11. On Wednesday of this week (and sadly I wasn't able to witness the event) the locomotive was moved to its new home at Epping where it will now undergo restoration. The following photos are by Simon Cartwright and are reproduced from Craven's site. They were taken about twenty-four hours after the loco's arrival at its new permanent home. To read more about the project visit Craven's site here and have a good browse around the site too, if you're not familiar with it. I know all involved would be delighted if you were to join up as a member too and support the group both financially and, if possible, by 'physical' input too! An item of news which has made both the BBC News and Evening Standard is that an Instructor Operator on the Northern Line has been suspended from duty following allegations that he was watching DVD's whilst in a train's cab and while he was (or should have been) tutoring a trainee. According to the press reports it was a trainee who brought the matter to the attention of management, quite rightly in my opinion, and it seems that there is other evidence which supports the allegation. If these allegations prove to be true I find this situation both deeply disappointing and worrying and I hasten to reassure that this individual is in a minority of, I suspect, one! No Instructor worthy of his job should display this sort of behaviour. The bottom line is that the trainee is driving the train under direction of the Instructor and the Instructor has full responsibility for the train. On a more individual point, the trainee is also driving on the Instructor's license and in the event of an incident, of whatever type, it is the Instructor that will be accountable. An incident can occur in a split second, and it is the vigilance of the Instructor that can prevent an event. By definition the trainee is under instruction; the Instructor has the knowledge and experience of the Line and Rolling Stock and his job is to pass this on to his trainee. How can this be achieved if he is not giving the situation 100% attention at all times - no matter how good a trainee is, whether he has perhaps been a driver on another line or even if he is an existing driver who is being refreshed, perhaps after a period of extended absence, is irrelevant. London Underground has issued a statement on the matter which is reproduced by both the BBC and The Evening Standard. If the matter is proven I sincerely hope the Instructor is dealt with appropriately; our staff suffer enough credibility problems with the media without this kind of behaviour adding additional fuel to the fire. This matter has now been considered by a London Underground Disciplinary Board and has resulted in the individual concerned being sacked in view of the seriousness of the matter. He has seven days in which to appeal against the decision. The Evening Standard's web site has more details. In view of the extent of this incident, and that it is likely to be of an evolving nature, I have added a new page on the topic here. In essence, the outcome of the examination of Metronet and Tube Line's first year of operation is 'could do better' and 'must try harder'. There have been some successes, but there is still much to be done. The summary and a link to the full report can be found here. Also released is the above report. Essentially, the result is that procedures are 'robust' but it does highlight some areas that could improve. London Underground have committed to making the needed changes. As has, by now, been well publicised elsewhere, a Piccadilly Line train derailed at slow speed at about 13:30 on Friday 25 June 2004 whilst entering the sidings to the east of Hammersmith station, blocking the Piccadilly Line tracks and, initially, preventing the District Line service as well. London Underground's Press Release issued shortly after the event can be read here. As I was working at the time and witnessed some of the events personally I can add a little information to this from events I saw and from accounts that were related to me. The train concerned had suffered what appeared to be and is called a 'Main Line Burst' - that is the train had lost the compressed air supply which is not only used to operate the doors and brakes but is also related to many other of the trains systems - between Ravenscourt Park and Hammersmith on the eastbound 'fast' road. The loss of the supply will cause the train to come to a halt - all part of the 'fail safe' design. In itself a 'burst' is not an unusual event, usually being caused by a broken pipe or connection. There are procedures which the Train Operator is able to follow that will allow the train to be moved safely and at slow speed to enable the train to be moved to the nearest depot or siding. It appears however that the cause of the 'burst' was that one of the train's compressors had (initially) become partly detached from the train. The driver would have had no indication of this. It seems that the train proceeded safely into Hammersmith station, where the passengers were safely detrained. However, as the train was being moved into the sidings, the remains of the compressor detached and (this is my interpretation of events) caught between the track and one bogie on the train, derailing the one bogie of the second car which, in turn, caused damage to both the running and traction current rails. I understand that the District Line's current rail was also slightly damaged, hence the suspension initially of the District Line service too. Four Piccadilly Line trains were also 'stalled' behind the failed train between Acton Town and Ravenscourt Park and they were obviously unable to move forward until the failed train was moved. Procedures were followed to allow trains stalled outside stations to be moved to enable them to be safely detrained of their passengers. The driver of the train immediately behind the failed train apparently reported that there was debris which appeared to be parts of a compressor or motor on the track between Ravenscourt Park and Hammersmith. The various parties who would need to be involved in both the investigation of the incident, the moving of the train and the repairs to the track were soon on scene. It seems that the first action of London Underground's Emergency Response Unit (ERU) was to restore the current rail for the District Line to enable its service to be resumed. As a result of the incident the Piccadilly Line was suspended between Acton Town and Hyde Park Corner in both directions. Shuttle services were introduced between Acton Town and Heathrow and to Rayners Lane. I believe that a similar shuttle service was introduced between Hyde Park Corner and Cockfosters. Initially it was hoped to restore services during the evening, but the re-railing process was more complex than anticipated. Piccadilly Line services were not restored until the start of traffic on Saturday 26 June 2004 and the stalled trains were not able to be removed back to Cockfosters Depot until this time. Those are the 'bones' of the incident. More will be added as further detail comes to hand. In a Press Release issued on 14 June 2004 it was announced that under new powers under S30 of the Anti-Social Behaviour Act 2003 the authorities can order youths to disperse. Failure to do so can lead to a fine of up to �2,500 or up to three months imprisonment. Under the terms of the Act for a period of six months from 14 June 2004 orders have been obtained covering all the stations from Barking to Upminster on the District Line. 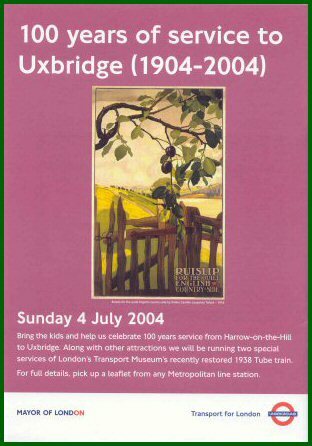 On the 4 July 2004 it will be 100 years since the public opening of the Metropolitan Railway's branch to Uxbridge. To mark this occasion the restored 1938 Tube Stock Unit will be making two special runs, the first departing Uxbridge at 11:12 and returning at 14:19, the second departing at 15:26 and returning at 18:19. I believe that the routing for the trips is Uxbridge -> Harrow-on-the-Hill -> Amersham and return. Tickets are on sale for the trips (cost �10.00 for adults, $5.00 for under 16's), though it may be that they are now fully booked; the sales are being dealt with through the Group Station Manager, M M Patel, who may be contacted on 020 7918 9414. Even if you can't get a place on the 'specials' it may well be worth a visit to Uxbridge to view and witness the celebrations.